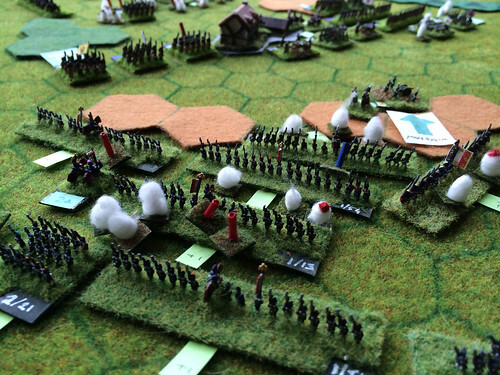 The third of the Craonne refights was a solo game in 6mm. Learning from the previous two I transferred Roussel's 6th Heavy Cavalry Division from Grouchy in the centre to Ney on the right flank. Rules were my own Steady Lads Steady (SLS) using a 100m hex grid and 20min turns. Start time was 1100, with the French having already taken Hurtebise. Unless stated all flanks are with regards to the French, and South(S) = left flank and North (N) = right flank, and West (W) is the direction of the French advance. LC = left centre, RC = right centre. To save on buiding terrain I used the arrowed hexes to show the main slopes, map style. T1 (1100): Charpentier (L) and Rebeval (R) again press into the woods either side of the neck. 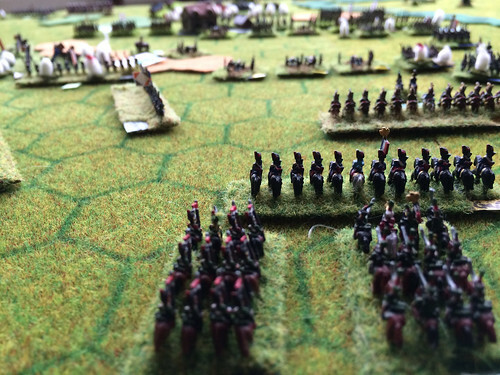 The French and Russian guns duel on the neck with both sides infantry suffering. T2: LC: Jaegers charge YG Voltigeurs but bounce. 2nd Jaeger regiment comes up but is charged and forced back by the YG. YG now in control of the wood. C: One of Rebeval's battalions is routed by gunfire on the neck. Russians exchange damaged battalions with their 1st line reserves. RC: Rebeval's skirmishers advance to contact in the wood. R: Ney pushes on to Ailes, and the Cossacks descend off the plateau. C: Two more French battalions routed by the gun fire. Russians also suffering. RC: Two of Rebeval's battalion charge in against the Jaegers, one bounces, the other goes into melee. R: Ney's Dragoons push forward to meet the Cossacks. 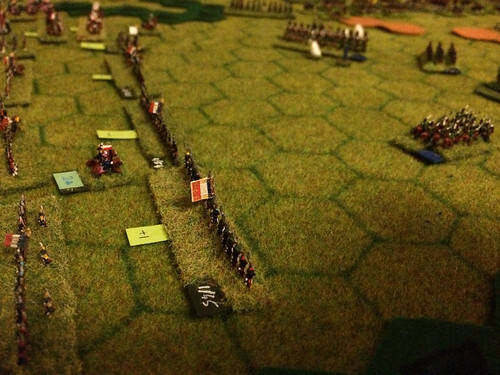 T4 (1200): L: Nansouty arrives on the board, threatening the Russian R flank. C: Christiani's Middle Guard begins to fill in the gaps on the neck caused by the decimation of Rebeval's battalions. R: Cossacks charge Ney's Young Guard, who form square and the cavalry bounce. 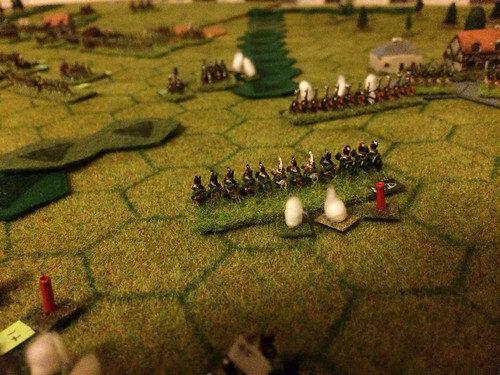 More cossacks charge Ney's Dragoons but also bounce. So far I'd been using the card driven activation I normally use with SLS. One downside is you spend a lot of time trying to find the formation (Division) on the table, and often you then don't want to do anything with it. So at this point I started using a PIP based system, each side getting about 5 - 10 PIPS a turn and being able to assign one or more PIP to a formation based on how keen they were to activate it first. This way not all units move, and its clearer who's going to activate. Sides activate formations alternately within a given bid value. T5: L: Nansouty's cavalry routs some Russians caught forming square. Charpentier's skirmishers are trying to disable the Russian battery on the neck but having no effect. C: The Middle Guard begin to push forward. RC: The first Jaeger battalion finally breaks from the melee. Dragoon face off against Russian Cossacks on the slope above Ailes. T6: L: De Morvans Young Guard (supporting Nansouty), and Exelmans mixed cavalry division arrives on table. Nansouty's Guard Chasseurs a Cheval swoop down on the Russian line, routing a battalion. Two cossack regiments try to counter charge but bounce off the rest of Nansouty's cavalry. C: Two battalions of Christiani's Middle Guard go into the assault supported by the Guard Artillery. The LH battalion routs a Russian Musketeer battalion and forces another back, and takes a 12 pdr battery. The RH battalion is stuck into a melee with a Grenadier battalion and taking damage. CR: Rebeval's forces reform having routed the last Jaeger battalion. T7 (1300): L: Cossacks charge Nansouty again but are repulsed, but 1st Guard Lancers shaken. De Morvan's infantry slowly advancing as the Russians try to stabilise their R flank. LC: Charpentier finally has his Division all out of the woods. C: The RH MG battalion is routed, the R of the Russian line holding, but only just. The next wave of MG battalions is coming up. RC: Ney's Spanish Brigade catches the last Jaeger battalion retreating out of the woods and decimates it. R: Dragoons push the Cossacks back up onto the plateau. Ney's leading forces now into the woods and swamp N of Ailes - aiming to bypass Ailes leaving the Spanish brigade to take it. T8: L: Slow advance by De Morvan. 1st Guard Lancers make an opportunistic charge against a Russian 3rd line gun behind La Bovelle, take it out, but find themselves embedded in the Russian squares. 2nd Guard Lancers rout a Russian battalion from square (it was already damaged), and the Guard Chasseurs a Cheval engage another square. C: Christiani finally clears the Russian 1st line by the neck, routing 2 battalions and taking two batteries. R: Ney makes slow progress through woods pass Ailes. Roussel's Dragoons are up on the plateau threatening the Russian 2nd line, but being shadowed by the Cossacks. Decided that the PIP based command and control system was making little difference as most bids were for just 1 point, so back to old card based system. 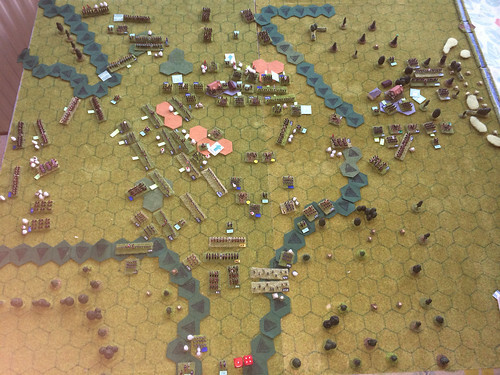 The other change was to add 2 hex to all movement, so as to enable the 2nd wave of French troops to move into action more quickly and also give Ney at least a chance to reach the board edge - which given the woods and swamp he could not arithmetically meet given the current movement rates even though unopposed. The +2 worked well so I may keep it. T9: L: 3rd Guard Lancers and Cossacks clash, whilst 2nd Guard Lancers take out another square. De Morvan is pushing forward and Rebeval's Young Guard force 2 Russian battalions back. C: Christiani's Middle Guard clears the Russian 2nd line by flank attack and Guard Artillery. Old Guard Cavalry finally on board. Russians forming 3rd line in front of La Bovelle. RC: Roussel's Dragoons push two Cossack regiments back, and roll up left flank of 2nd line, routing a battalion and taking two batteries and forcing another battalion back. R: Ney making good progress in the wood and the Spanish Brigade about to assault Ailles. T10 (1400): L: Nansouty's Guard Heavy Cavalry pushing hard down past La Bovelle push a Russian dragoon regiment off the board. A wave of De Morvan's Young Guard crash against the R of the Russian 3rd line alongside La Bovelle. Note: Nansouty here has made the move that failed in the Liphook game, managing to get passed the L of La Bovelle before the Russians could close the gap. C: Melees going against the Russians, and French Guard Artillery moving up to pile on the pressure. R: Ney's leading units through the wood. Spanish Brigade guns opening fire on Ailles. T11: L: Nansouty's Guard Cavalry finally clear all Russian cavalry from SW of La Bovelle. De Morvan's YG pushes one Russian bn back, but repulsed by Russian 3rd line. Other melees still ongoing. C: Guard artillery opens up on the 3rd line. Old Guard finally make it on to the table. Christiani's Middle Guard reform ready for a renewed attack. R: All of Ney's 1st and 2nd Voltigeur Divisions through the woods. Spanish division assaulting Ailles but not going well. Time for a change of Command and Control again. Prompted by a review of some other rules I now draw 5 cards, and checking suit only that is how many formations each side can move, alternating as long as possible. Choice of formation up to commander, but only 1 activation per turn. Repeat in 5 card blocks til end of turn. Worked really well. T12: L: Guard Lancers finish clearing most of the Russian light cavalry off of the board. LC: Final Russian 2nd line battalion routed, had really been holding up De Morvan and Charpentier from getting to grips with the Russians L of La Bovelle - leaving the cavalry to have to do most of the work. C: Guard Arty rout one Russian battalion through weight of fire. Middle Guard assault stalls on L due to ferocious return fire from the Russian guns, but goes in at R. Old Guard and Guard Cavalry parked up to watch the final moves. Roussel's Dragoons reform and Charpentiers Young Guard hurries in to support the MG.
R: The fight for Ailles goes on. T13 (1500): L: Final Russian cavalry routed. Fr cavalry now has free reign and is behind the Russian 3rd line which it ploughs into the back of.De Morvan's Young Guard now pushing round the L of Bovelle as well. C: Melees all around Bovelle with YG and MG and Russians. R: Ney reaches the edge of the board (Hurrah!). One Jaeger battalion forced out of Ailles, but the 2nd Jaeger battalion has repulsed the French assault. T14: L: De Morvan routs one Russian battalion which runs into the Cuirassiers milling behind it, carnage. Nansouty's cavalry now against the back of the Russian line. De Morvan is now heading for the board edge, the other Divisions and cavalry having La Bovelle under control. C: The Russian defence crumbles as battalion after battalion beaten in the big melee. The remaining Russian guns defending La Bovelle taken in the flank. Dragoons try and join the fight but their target on the extreme R of the Russian line forms square in time and repulses them, Horse artillery brought up to support the Dragoons. R: Spanish Brigade reforms ready for a renewed assault. The final fight around Bovelle. Smoke puffs show damage, red markers disorder and blue markers ongoing melees. T15: L: Last battalion L of La Bovelle routed and De Morvan now at the board edge. C: The melee still going on against the last 4 Russian battalions, but with Nansouty now in their rear it's all over. R: The final Jaeger battalion pushed out of Ailles. At the end of Turn 15 (1600) I declared game over. Checking measurements, by the end of Turn 18 (the planned game end and same as others games) the Old Guard, Guard Cavalry and Ney's Cavalry could all have been off board. So I think I'd manage to learn the lessons of the last two refights - essentially make sure that all three prongs of the assault (Nansouty, Centre and Ney) all had all-arms support, Infantry, Cavalry, and Artillery. As Napoleon's Maxim XLVII says "Infantry, cavalry and artillery are nothing without each other..."
I'll try and do a final post to compare the three battles. French: 10 formations, and ended with 6 formations still active (majority of elements with less than 3 damage), and 4 formations spent. Russians had 10 elements, but all spent. Russians had 42 units, so 210 CEF points, and had 14 CEF left on the board. French had 67 units so 335 CEF points, and had 174 left on the board. So the victory "cost" ~160 points, which is 32 battalions, about 4 divisions or 1 Corps. Probably a lot more than Napoleon would have been willing to pay. 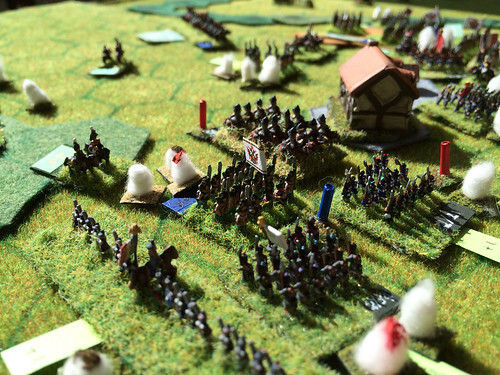 Listed below are links to blogs that reference this entry: Battle of Craonne - 6mm. This page contains a single entry by David published on August 18, 2014 6:23 PM. Confederation of the Rhine - 6mm was the previous entry in this blog. Confederation of the Rhine 6mm/20mm is the next entry in this blog.